If you have employees and are running a payroll, you will need to enter this information into Pandle. It is not enough to categorise your payments to employees when completing your banking. The wages owed to employees, and tax and National Insurance (NI) owed to HMRC, need to be entered first so that the accounts show the amounts owed even if they have not yet been paid. For example, let's say you owe £1,000 to HMRC for April's tax and NI but did not pay it until May. Your accounts still need to show how much is owed to HMRC at the end of April, so simply processing the payment from the bank in May would omit this liability from April's reporting. These categories need to be updated on each pay date, whether it be weekly, bi-weekly or monthly. The categories need to be update through adjustments (sometimes called journals) and getting them correct can require knowledge of bookkeeping principles. 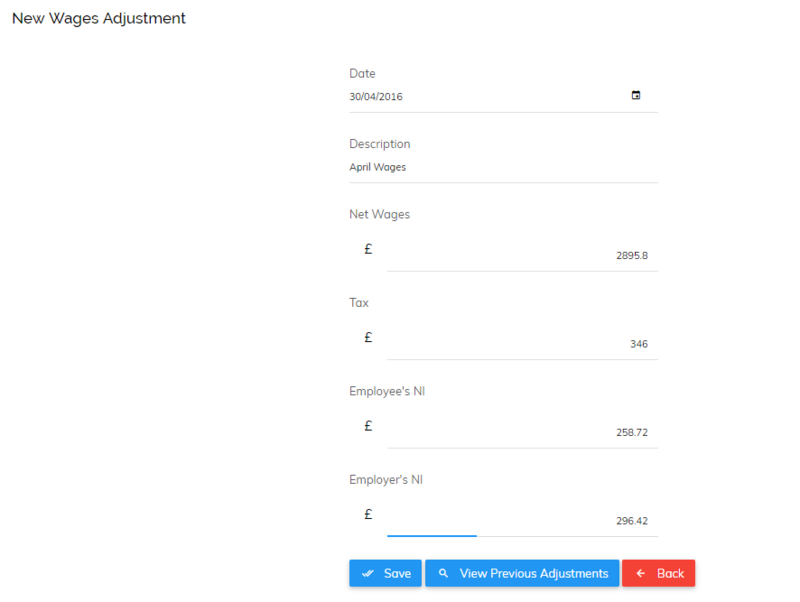 However, for basic payroll we have included 'wages adjustments' in Pandle which completes these adjustments for you. 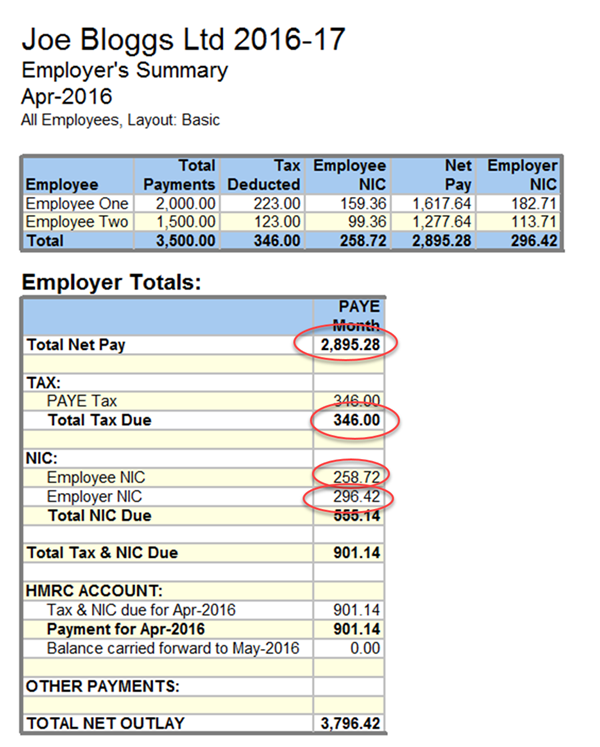 Date: This is the pay date of the payroll (last date of the month etc.). Net wages: This is the total actually due to be paid to employees (i.e. after tax and NI has been deducted from them). Tax: This is the total tax deducted from all employees for the pay period. Employee's NI: Total employee's NI deducted from all employees for the pay period. Employer's NI: The employer's NI which is due from your business for the pay period. You should be able to find these figures from a report in your payroll software. An example of such a report is below. As you can see, it very clearly shows the amounts that are due. The figures Pandle requests should be shown on the report as above. Once saved, you will notice the balances of your categories update. The following expenses are now included in Pandle (even though you may not pay employees until later). You'll also be able to see the amounts owed. When completing your banking in Pandle you should use these categories for the payments to HMRC and your employees. Please note, if your payroll is a little more complex, i.e. if you have other deductions to include, then the wages adjustment form will not be suitable. Instead, you will have to use regular adjustments in Pandle.